Basement of Ghoulish Decadence: Finally, the limited VHS of SLEDGEHAMMER has been announced! 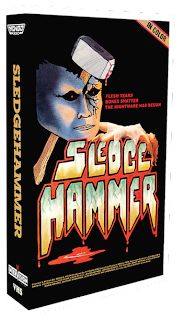 Finally, the limited VHS of SLEDGEHAMMER has been announced! As previously reported here, via Intervision Picture Corp.:"The rumor is true! Mondo, the collectible art boutique arm of the Alamo Drafthouse Cinema in Austin, TX, officially announced today their partnership with Intervision to reissue Sledgehammer on VHS — the inaugural release in their all-new VHS-only label “Mondo Video.” Limited to 100 copies, the collectible tape features the original 1983 box art and copy packaged in a white clamshell case. The VHS will be available to coincide with the film’s May 10th DVD release and “Terror Tuesday” screening at the Alamo Drafthouse Ritz and on sale exclusively at MondoTees.com, retailing for $20, on Wednesday, May 11. Mondo creative director Justin Ishmael says, “I am downright crazy about VHS, so it gives me great pride that we get to make Sledgehammer the first release on our new Mondo Video label. There has been a major resurgence in VHS collecting the last few years after it was announced that the tapes would stop being made, so being fans ourselves, we jumped at the opportunity to actually resurrect the format and release some of our favorite movies on VHS. People thought they killed the video tape back in 2008, but like a phoenix, it is rising from the ashes! Never Forget!" Sold out in 14 minutes!